In this post our in-house dentist Dr. Chhaya Chauhan explains the things you should know if you’re considering a whitening toothpaste and provides a list of purchase options for you to choose from. She also explains why whitening toothpaste may not quite work the way its name suggests. If you’re interested in whitening your teeth, check out our teeth whitening hub page, which runs through everything you need to know to do it safely. What ingredients should I look out for in whitening toothpaste – which are good, which are bad? Are whitening toothpastes worth it, and are they safe? Do toothpastes for sensitive teeth work? Whitening toothpaste does not actually whiten teeth. It contains abrasive agents that end up removing the surface stains from teeth. Given this, it would be more accurate to refer to it as stain removal toothpaste rather than whitening toothpaste. This type of toothpaste may work well for things like tea and coffee stains but not for teeth that have a base colour of yellow. There are some toothpastes that are even more abrasive to remove more stubborn stains, such as smokers’ stains on teeth. Use of such abrasive toothpaste over a long period of time can actually have a damaging effect on the precious enamel of teeth and subsequently increase staining. Some toothpastes contain a bluish tinge chemical; this can give an illusion of whiter teeth, without actually changing the tooth colour at all. Only tooth whitening agents can change the baseline colour of teeth. Toothpastes cannot do this job. We have covered tooth whitening agents in detail in our professional teeth whitening post. A great way to keep your teeth looking nice and white and healthy is simply to brush them well with a fluoride toothpaste twice a day. This will help to prevent the build up of common stains from things such as tea and coffee. Many people struggle with or don’t know how to brush correctly using the modified bass technique (using a rotating motion at the gum line). If you’re not sure what the correct method is, see our post on how to brush your teeth properly. If you do find it difficult to use the correct brushing technique, an electric toothbrush can help (although it isn’t essential) because the powered movement of the brush head aids brushing, maximising plaque removal. 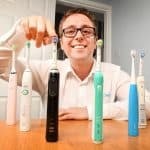 Using a fluoride toothpaste twice a day with the correct brushing technique will be more effective at preventing and removing stains than brushing less frequently with a whitening toothpaste and not using the right technique. 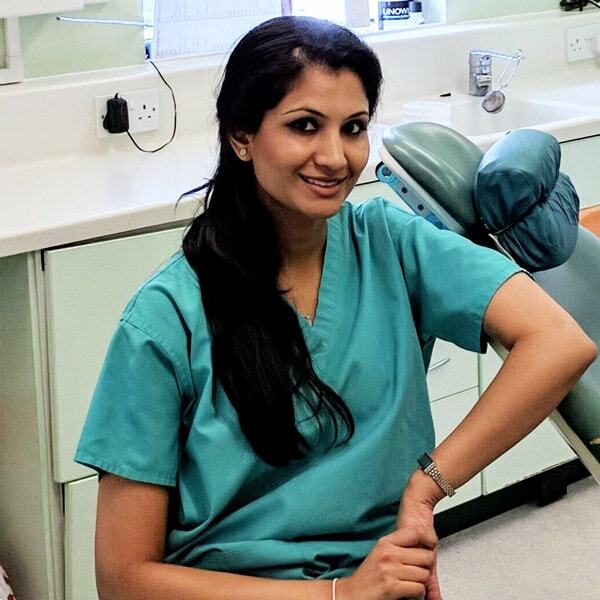 In June 2018 there was an episode of Supershoppers on Channel 4 that tested how well various toothpastes, both ‘whitening’ and regular, removed tea stains from perspex teeth. The tests found that the top 4 performing whitening toothpastes only removed 50% of the stains. They also tested toothpastes that don’t make whitening claims, and on average they performed almost as well as the whitening ones, removing 42.5% of stains on average, compared to the 47% average of the whitening pastes. The non-whitening ones are also less abrasive, meaning they have less chance of damaging your teeth. Going to see a dental hygienist regularly can be very beneficial. The hygienist is a dental professional qualified in cleaning teeth and gums. The hygienist will clean your teeth and gums, removing plaque, calculus and stains. This will help your teeth to look white and healthy thanks to the absence of any unsightly stains and build-up. The hygienist can be just as effective —or in-fact more effective — at removing stains from your teeth than a product bought online or in-store. However, regardless of whether stains are removed by the hygienist or a stain removal product, the base colour of the teeth will remain the same unless it is bleached with a peroxide. It is this bleaching that can be truly referred to as teeth whitening. Below are some of the ingredients you may see listed on whitening toothpaste. Here is an explanation of what each ingredient does. Peroxides – these are the chemicals that will actually make a difference and change the base colour of the tooth. For legal reasons its concentration in toothpaste will be very low (0.1% or below). We cover toothpaste ingredients more generally in our article toothpaste ingredients: what’s safe and what isn’t? Yes and no. If your teeth have a good base colour already and you just have some minor extrinsic stains, e.g from tea or coffee, then a whitening toothpaste can help to remove them. However, if you have a buildup of plaque and calculus then you would need to see a hygienist to have them professionally removed. Sometimes the abrasive agents in these toothpastes can actually make sensitivity worse so you must be careful of what you are using, and how often. If the base colour of your teeth is yellow, then you may need professional tooth whitening to help brighten the colour of your teeth. The problem is that it is very difficult for the untrained eye to differentiate which type of discolouration you have so it is best to seek advice from your dentist before using anything. Because of the nature of abrasive toothpastes, it is especially important that you do not use them for a prolonged period without consulting your dentist. Sensitive toothpaste can work for the short term as long as you continually use it. There are certain ingredients such as novamine or potassium nitrate that can help as long as you keep using the toothpaste. Rather than relying too much on a sensitive toothpaste, though, it makes more sense to try to discover the cause of the sensitivity. Sensitivity can be caused by several different reasons such as gum recession, cavities, gum disease or even a dental abscess. Only treating tooth sensitivity without knowing the cause of it can be dangerous. For example, if the source is a cavity and a person decides to try to treat it using toothpaste, the cavity may get worse and lead to a life-threatening dental abscess. Similarly, using a whitening product, be that toothpaste or something else, can also exacerbate existing dental issues. Always consult with your dentist as to the source of the sensitivity and use the toothpaste they recommend. Like with anything it is important to do your research before making a decision to whiten your teeth — don’t just dive in and start using a whitening product without taking the due care necessary. A dental professional can give you good advice about what the best product is for you, even if it is a simple toothpaste recommendation at your next check up. As we’ve mentioned above, regular toothpaste can be just as effective as whitening toothpaste, in-fact it can even be a better choice if it’s not as abrasive. It’s certainly not worth spending over the odds for a whitening toothpaste, and it’s not really possible to say definitively which is ‘the best’. However, if you really are set on trying one, here are some good choices to get you started. 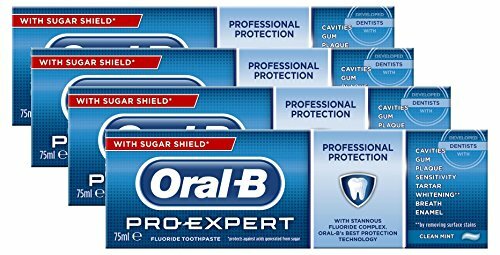 Oral-B Pro Expert (view on Amazon) is one of my favourites. It gives an all-round clean and also is quite good at removing the stains. It has a nice taste and leaves fresh breath. I also really like to pro expert dental tape. It is one of the best for removing plaque has tastes great and leave your mouth feeling very fresh. 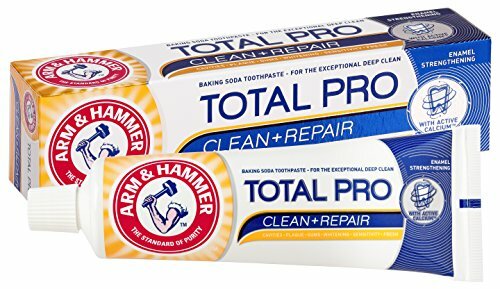 Arm & Hammer Total Pro (view on Amazon) is a great toothpaste that has the active ingredient of bicarbonate soda and fluoride. It is a good all-round toothpaste combating most of the major areas such as gum disease and cavities. Unfortunately it is a little salty for my taste and doesn’t really give you the same fresh feeling after brushing, but does a good job. 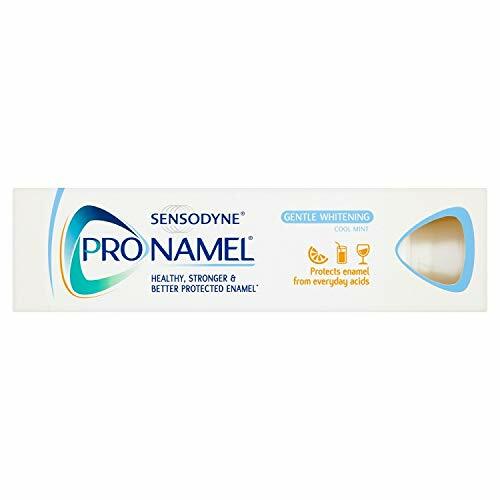 Sensodyne Pronamel For Whitening (view on Amazon) is great at reducing sensitivity as it contains potassium nitrate. It’s a nice toothpaste from Sensodyne, which is known for its products for sensitive teeth. 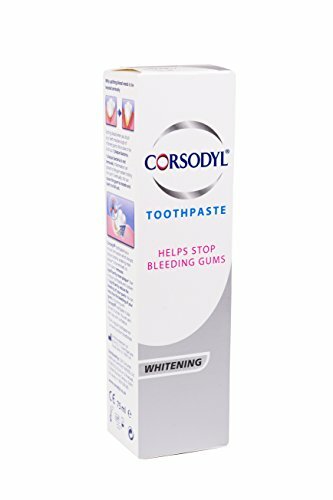 Corsodyl toothpaste (view on Amazon) is one of the best for gum disease. I’ve seen it time and time again with my patients returning with great results. Unfortunately, it is expensive and tastes awful so many patients are put off by this. This is a shame as it is one of those that really works well for stain removal because of the bicarbonate soda. 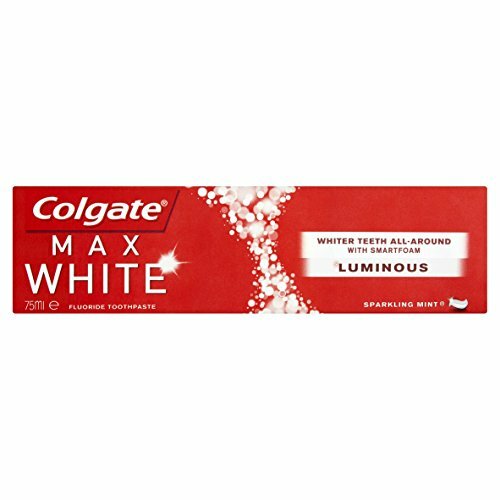 Last but not least Colgate Max White (view on Amazon) contains some hydrogen peroxide, which is the active ingredient in tooth whitening kits. The amount of hydrogen peroxide is very low and will have no where near the effects of a proper home whitening kit administered by your dentist. It also contains a good amount of fluoride 1450 ppm so it is worth a mention. I have been using Zoom with trays at home. Supplied by my dentist. I find tgat my teeth whiten half way up from the tips,but the half up to the gums remains markedly discoloured. It is noticeable when I smile. What can I do to remedy thusvproblem? In theory if the gel is being applied in the trays correctly and they are getting a nice snug fit to the teeth, there should be a fairly even whitening to the teeth. I am presuming you are following the directions given by your dentist. However, everyone’s teeth are different, so sometimes this is not the case. It is probably best to make an appointment with your dentist to discuss your personal circumstances. what do you think about Swissdent Extreme thoothpaste? We have not carried out hands-on testing of this toothpaste, in particular, to make first hand comment. It is expensive considering it theoretically does the same job as most other pastes. Nice to see it is SLS free and a low RDA score.